The name of the breed speaks for itself as Violator Kush is a hard hitting Indica dominant hybrid. The specialists from Barney’s Farm have combined the strain of Hindu Kush with Malana, Himalayan genes from the regions of Parvati Valley. This proved to be a very strong stony cannabis which gives a comfy couch-lock effect. The Barney's Farm feminized Violator Kush smokers enjoy both the distinctive musty smell and the earthy flavour. The plant may be cultivated either indoors or outdoors as it grows short (about 80/90 cm), however pretty bushy with well-developed side branches. One should note that the buds appear to be so dense that they might need tying or staking for support. 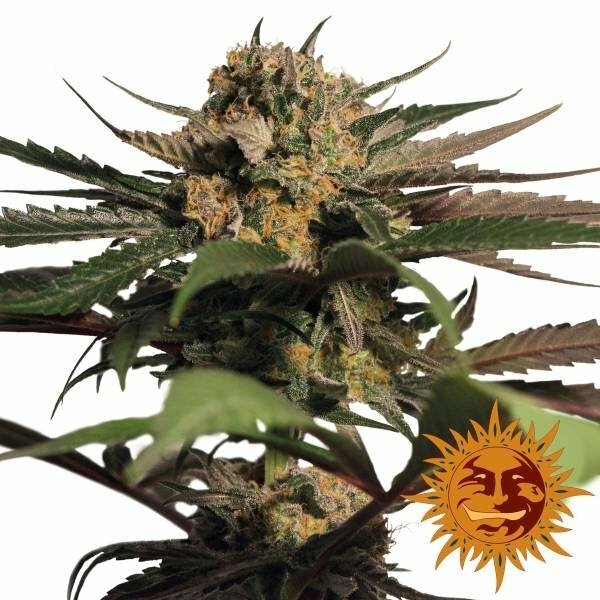 Violator Kush feminized matures as a beautiful plant with big dark green leaves and an enormous amount of trichomes looking like silver frost. Flowering time is relatively short (from 8 to 9 weeks) and after that time all weed aficionados should expect heavy crops of good quality and marijuana that contains 22% THC and 1,3% CBD. As an Indica it tolerates mild stress and shows good disease resistance so without any effort you should easily hit 650 gr/m² indoor.